A few days ago I read an article about an alternate ending that was trending online for the TV show Friends. If you loved (or still love) Friends, you might want to skip this blog and return when I’m back to writing about the rest of my depressing life, because this theoretical ending ain’t gonna leave you with a fuzzy feeling in your heart for the New York gang that stole our hearts in the 90s. The theory goes that Phoebe is actually a meth addict and has basically spent ten years watching the rest of the gang from out on the street where she lives and imagining that she is one of them. The suggestion, put forward by a fan, is backed up by the fact that during the show’s ten-year reign, Phoebe’s character told the others that her mother was a drug dealer, that she hung out with a group of friends behind a dumpster and that she was homeless. It’s a dark theory for a show that was primarily a decade-long romantic comedy. If the show had ended in such a way, it wouldn’t be the first time a long-term and beloved sitcom was found to be purely the imagination of one of its cast members (spoiler alert!). Roseanne, starring its namesake Roseanne Barr, was revealed in its final ninth season to be a story written by the character Roseanne Connor herself. Some of the major plot lines, such as the Connor’s lottery win, never actually happened, and certain character aspects were changed; Roseanne’s sister, Jackie, played by Laurie Metcalf, was in fact a lesbian, not their mother, Beverley, and Mark and David, the boyfriends of her two daughters, Becky and Darlene, were actually switched and dating the other daughter. The meth theory in Friends throws a creepy shadow on the whole show. Phoebe’s character is so eccentric and kooky, that it is quite believable that she could have spent the whole time cooking this up (excuse the pan, I mean pun). Her major storylines, such as being a surrogate mother to her half-brother’s triplets, being in love with scientist, David, who lived in Minsk, and having an evil twin, Ursula, always seemed far-fetched, although in line with her bizarre personality. So did the use of aliases such as Regina Phalange and Princess Consuela Bananahammock (can you imagine Rachel or Monica using these names?). But thinking about them as being generated from the imagination of someone addicted to methamphetamine, they seem plausible. 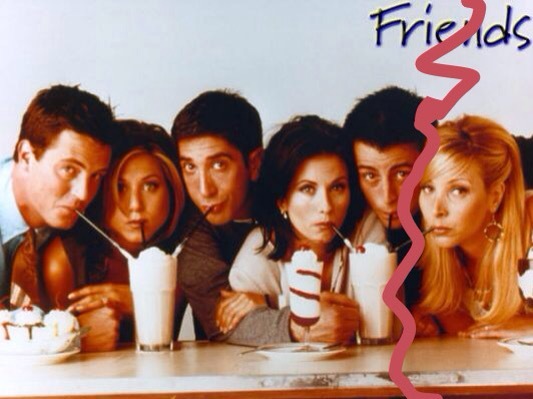 To me, Phoebe always was the outsider and never gellered, sorry gelled, the way the rest of the ‘cool’ ones did. Thinking about this made me recall something that happened soon after I left school. I had a group of around ten friends, and we were all outsiders. A few weeks after we’d finished school for good, I met one of my friends and we hung out on a big willow tree in the village where I lived. I remember being shocked as she told me that nobody really liked me. To make it worse, she went through each so-called friend one by one, to say she doesn’t like you, and she doesn’t like you, and so on. It was a bit of harsh reality for an already shy, unconfident 15 year old to hear, and in my view years later totally unnecessary, since it would have been easy for us all to go our separate ways now that we weren’t bound together by school lunchtimes. I am friends with one or two people from my old group of school friends now, mainly via Facebook, but it took a long time before I could believe in those friendships. The girl who was so hurtful all those years ago is not on my friends list, and would not be without a full and begging apology for her adolescent behaviour. It is this experience, together with my ability to imagine feelings from men that were never there, which leads me to believe in the potential for this alternate finish to Friends. I feel such sympathy for Phoebe if this ending were to be the case; so meth-addled that she doesn’t know truth from reality, and probably wouldn’t command such sympathy from her “friends”, should they see her staring creepily through the window of Central Perk at them drinking their skinny lattes and double shot cappuccinos. The problem with endings such as this one, is that they do not leave you happy to walk away from a beloved series with a smile on your face and a sense of satisfaction and closure. For anyone who’s ever seen David Lynch’s Twin Peaks, I was always too creeped out to walk away from the season two finale with nothing but gritted teeth and an accusatory how-could-they-do-that towards Lynch and his crew as I tried my best not to be permanently scarred by the final scene. Twenty-five years later with the third season expected in 2016 or 2017 and I’m hoping they’re going to address that seriously bad choice of endings. But Twin Peaks, a supernatural crime drama, with a penchant for its weirdness and strange characters, cannot really be compared with Friends, which on the whole was a show about six pretty normal people hanging out in a Manhattan loft. While I was a fan of Friends, I was always more of a Frasier lover. I think perhaps the fact that the former was about a group of male and female friends, who were, let’s face it, the in-crowd of their own show, which made me uneasy. Friends started three months after I finished school, which meant that I no longer had a big group of friends that hung out together and I certainly didn’t have any male friends until my mid-twenties, which was around the time that Friends came to an end. TV shows, like films and books, will always be an outlet to another world; a escape from real life, from our mundane and often uneventful lives. As we get to know characters, especially those that are there with us week-in, week-out over years and in this case, a decade, we think of them fondly because we have lived their lives with them. Their sadness, their joy, their laughs and their tears. To imagine a different world for them, an alternate ending that leaves a bad taste in our throat is not what we want for the Dale Coopers of this world, let alone the Phoebes or the Rachels or the Joeys. Unless you have a DeLorean that is capable of rewriting alternate realities, we want to remember our characters just as they were thank you very much, in The One That Made Us All Laugh. Which episode was that? That’s right, every single one of them. Read the MSN article about the Friends theory here.